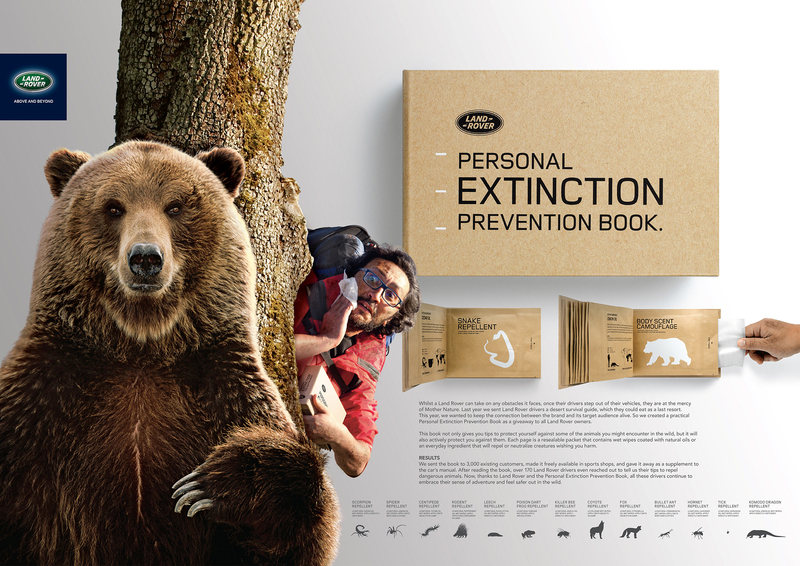 Land Rover MENA’s Personal Extinction Prevention Book won the Grand Prix for Design at the Dubai Lynx Awards recently. Land Rover wanted to give their existing and prospective customers something that they could keep with them at all times, smething that would be useful in the wild and promote the classic adventurous spirit of Land Rover owners. Whilst a Land Rover can take on any obstacle it faces, once their drivers step out of their vehicles, they are on their own. 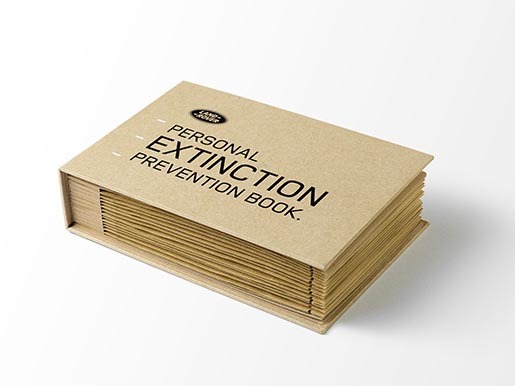 The Personal Extinction Prevention Book not only gives tips to survive against dangerous animals, but also actively protects its owner. Each page is a resealable packet that contains wet wipes coated with natural oils or an everyday ingredient that will repel or neutralize dangerous creatures. The Personal Extinction Prevention book was sent to 3,000 existing customers, and the initial response was very positive. 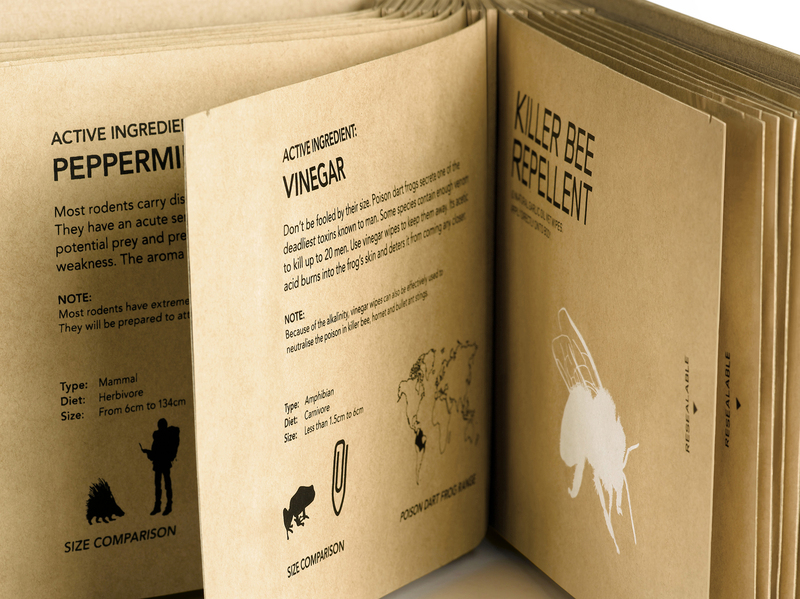 Land Rover showrooms were filled with requests for copies of this new adventure must-have. Over 170 drivers reached out to tell Land Rover their tips for repelling dangerous animals. 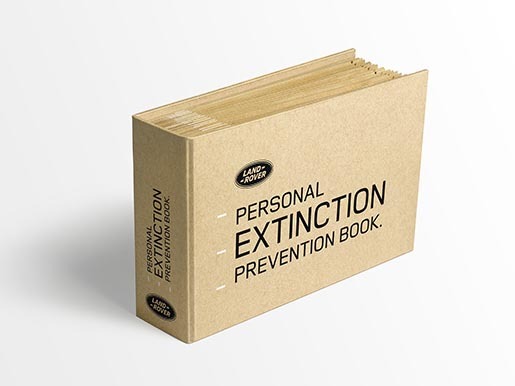 Land Rover was so happy with the concept that the book will now be given away as a supplement to the cars’ manual with every new Land Rover sold. The Personal Extinction Guide was developed at Y&R Dubai, UAE, by chief creative officer/copywriter Shahir Zag, creative director/art director and illustrator Joseph Bihag, copywriter Guillaume Calmelet, copywriter/producer Khaled Said, producers Binnu Cherian and Leng Panganiban, account supervisor Zaakesh Mulla, account manager Pierre Farra, head of production Amin Soltani, photographers Jeevan Nambiar and S. Kumar, working with Jaguar Land Rover marketing director Jean Atik.